Peter Piper Picked A PickleSickle? Yep. It's going to be the new tongue twister: "Peter Piper picked a peck of PickleSickle Pops." That would certainly tickle the co-founders of PickleSickle.com. They make the puckable PickleSickle Pop and market it primarily to schools, the very place such a tongue twister might thrive. But there's a method behind the seeming madness of the PickleSickle Pops. It's called tasty, refreshing,and healthy. John Howard, the creator of PickleSickle Pops, had made the frozen pickle juice pops for his customers at Outerskate roller skating rink and arcade in Seguin, Texas. Howard liked them, of course, but he was genuinely surprised that his pickle pops sold out every night to kids and their parents. They loved his pickle juice pops because of the taste and health benefits. 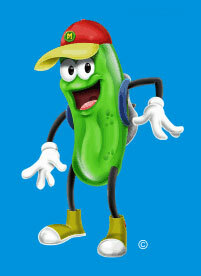 There are no artificial flavorings in PickleSpickle Pops and no high fructose corn syrup... just pickles. Co-founder of PickleSickle, David Millar, says that 100 percent of the pickle is sqeezed in a process, much like apples are sqeezed in the production of apple juice. There is a whole page of health information provided in a kid-friendly way on the PickleSickle site, which is interesting for adults too. The two entrepreneurs are doing a fantastic marketing job with PickleSickle. copyright© PickleSickle.com They have a line of PickleSickle characters prepared to market to kids, starting with PickleSickle Bob. Check out the birthday party page to see the party poster designs in progress at the KidsClub. Also check out the comments section. And you must listen to the Pickle Song , by Duncan Wells. I'm only providing all these links because they're fun! If you want to just order the PickleSickle Pops, they are available here in original PickleSickle and Hot Pepper Pickle Pops starting at $17.95 for 16 pops, shipping included! 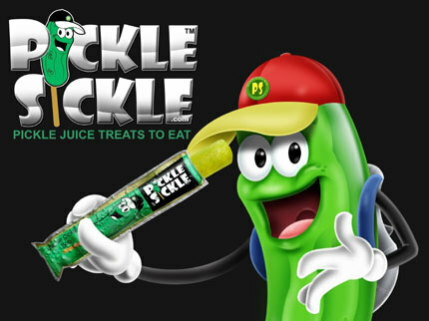 Watch for notices that PickleSickle is marketing cherry and lemon-lime flavored Pickle Pops. One question: Are they sour or half-sour?